Peak Season requires at least 3 or more nights - arriving or departing on a Saturday. July to mid August is a 7 night minimum. 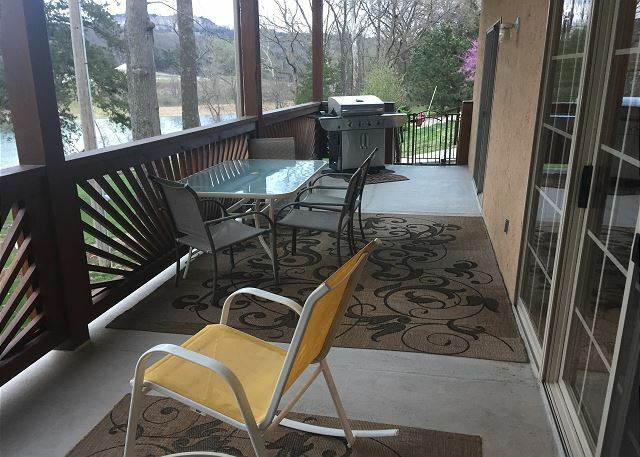 A wonderful 3 BR, 2 bath condo with a walkout from a covered 34'deck directly to the shores and dock on beautiful Table Rock Lake. Perfect for your family and friends, complete with all the comforts of home. 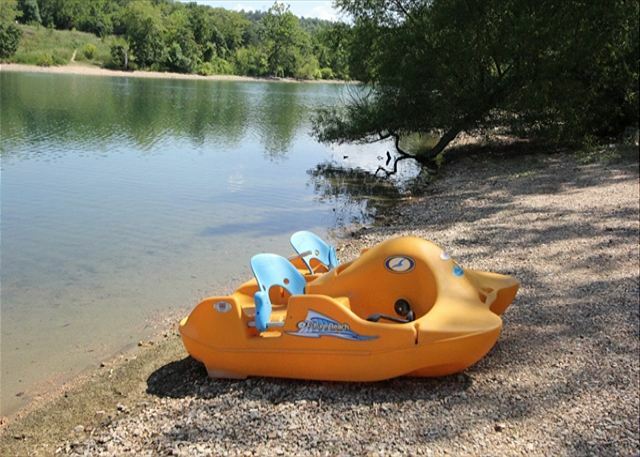 Enjoy boating from our boat dock with 11 x 30' slips, fishing, swimming, barbecuing or relaxing in your own jacuzzi - this is where it's at, just minutes from Branson 76, Silver Dollar City, Branson Landing, Showboat Branson Belle and more. Units are very nice and clean. Management staff is friendly and helpful. Location is close to everything. We have stayed here several times and look forward to coming back. The condo at Vickery Resort was very spacious and very comfortable for our family of 5. The boys, ages 8, 6, and 3 enjoyed throwing rocks in the lake, playing horseshoes, and playing at the playgrounds. The equipment at the playground could use some repair, but they still enjoyed it. There was construction taking place on the patios while we were there but that is not something they could avoid and it was being done during the slower time of the season. It was not disruptive to our stay. Very clean and a great location. This is a great 3 bedroom condo to stay in. Fully stocked kitchen. Super clean as well. The staff is excellent and very friendly. I highly recommend staying at Vickery resort. This was our family's 7th or 8th year staying at Vickery. Who's counting? The condo is clean, well-stocked and comfortable. A true home away from home. The location is perfect and the cove is quiet. We rent a boat slip for the week and the dock is well-maintained and a great gathering spot. I recommend Vickery to all my family and friends. It has become such a special part of the memories our family has been making. 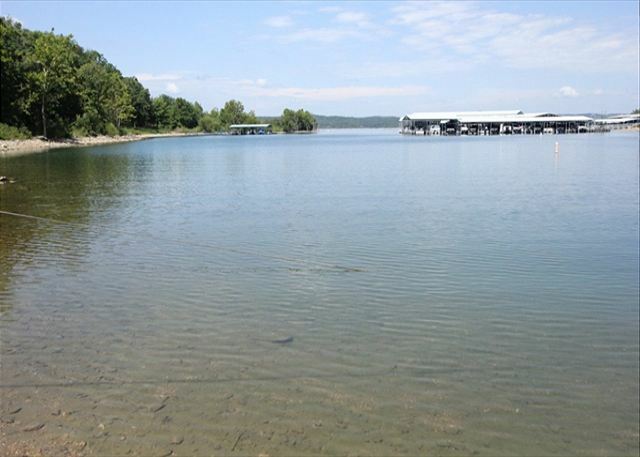 You won't find a better place at Table Rock Lake! It was great. The condo was clean and so spacious. We had everything we needed and more.We had a beautiful view of the lake. We had a wonderful time. VERY clean and relaxing condo. Pet friendly and on the water. Can't beat that. Will definitely be back! This was a very nice place to stay. The view was awesome and the boat slips extremely nice! We will be back. The condo was VERY spacious, felt like home, nicely decorated, quiet, and in a very good location. We were on the lake and yet less than 10 minutes from the strip in Branson. I love staying at Vickery Resorts. This was my 2nd year straight staying and Mrs. Colleen Blackman is a sweetheart. The condo was just what we needed for Thanksgiving holiday - clean, quiet, convenient location. The kitchen was well-stocked with appliances and kitchen tools - measuring cups, can openers, griddle, crockpot, lots of knives, etc. The staff was pleasant and answered questions we had. We enjoyed hanging out, watching movies, playing games. Kids spent time outside on the playground equipment while adults played horse shoes. It was nice sitting on the deck and watching the sunset. Nice job Vickery Resort! Vickery Resort is our first choice always. 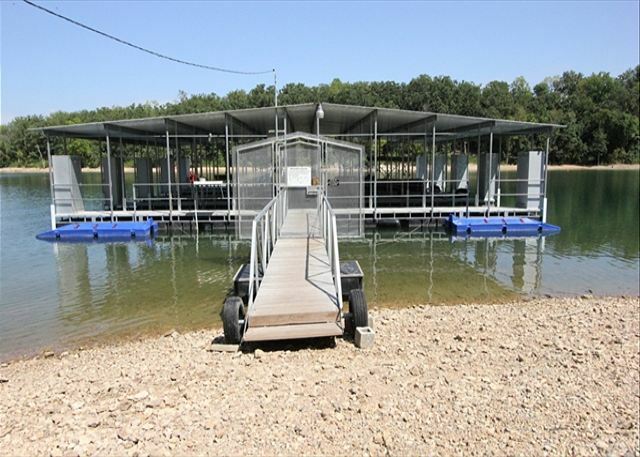 It offers the luxury of home living and vacationing on a lake. can't wait to go back next year! The condo, location and swim dock are amazing. We really enjoyed this room! We hope to stay here again! The Condo was very nice and Colleen made us feel very welcome. Would definately recommend staying here! From the moment we arrived I was impressed with the friendly and kind service. Everything was perfect. We loved the condo. So clean and nice. Had everything we needed to prepare meals. Close to the Lake and dock. Grounds were kept up very nicely. We cannot wait to come back! We have rented many vacation homes/condos over the last 30 years. I am a picky renter and review the rental properties very carefully. This was really a nice condo. Clean, well stocked dishes/appliances in the kitchen (but bring your own spice selection) and enough room for all of us (there were only 4 in our group). The deck space was really nice and I think this would be great in the summer. We really enjoyed all that Branson had to offer and loved Mr. Gilberts pizza, not far from this condo. I would enjoy bringing our boat back sometime, as the boatslips were great with very nice storage for your equipment. Renting a boat at Table Rock Marina was really easy too with very friendly staff. Thanks to Colleen for her help too. Also - we are from Wisconsin and were looking to get away from the real cold, but not drive too far. This fit the bill. What can I say? 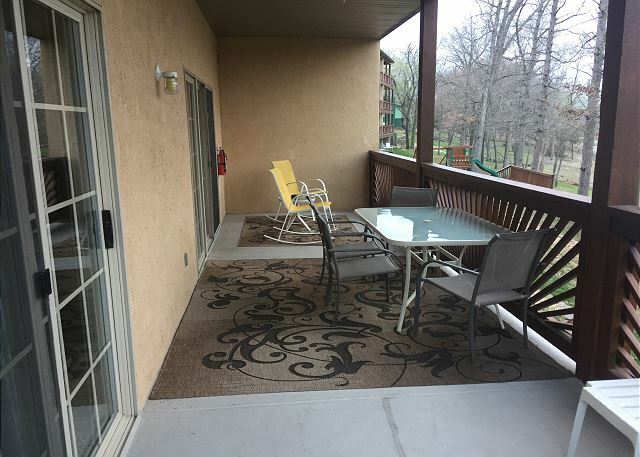 The unit was spotless, the view was excellent, the location is convenient to everything, and Colleen is a wonderful woman who makes sure her guests are happy. My family and I love our stay at The Vickery Resort. 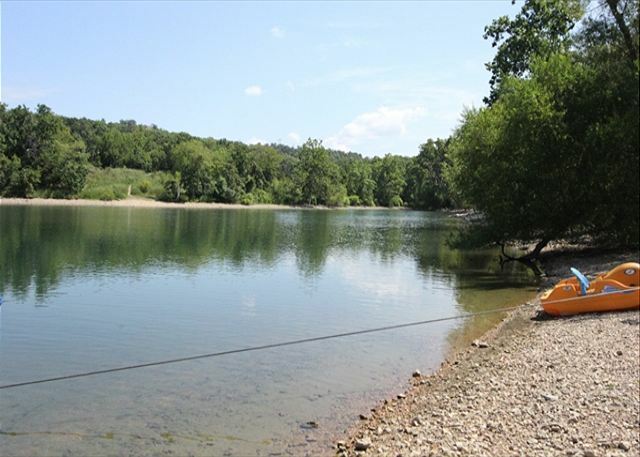 Plenty relaxation and loads of fishing. Colleen was SUPER SWEET. A1 place to stay. We always stay at the Vickery. Colleen and Terry are very helpful for anything you need and have become good friends. We were so pleased with our stay at Vickery. The view from our room was incredible! Access to the lake could not have been better! And the cabin itself was wonderfully updated and maintained. I've never stayed anywhere that felt as clean and welcoming as my own home, but this checked every box. My girls had the best time. We truly did not want to leave! And Colleen was so sweet! I absolutely cannot imagine staying anywhere else from now on when visiting Branson!!! 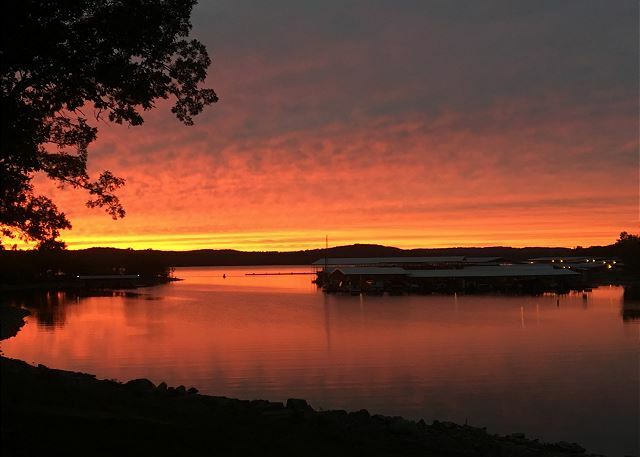 There has never been a time when we were disappointed staying at the Vickery on Table Rock Lake. The unit is always clean, the staff friendly and helpful. The view of the crystal clear lake can't be beat. If I can't have the ocean, this place comes closest to heaven! The unit was rented by four guys on a boating trip. The unit was spotless, well equipped and nicely decorated. We had a boat with us and the dock was very convenient. We would definitely return. The only problem was the $75 cleaning charge. We felt that that cost should be included in the nightly fee. 13 family members and I spent our vacation at Vickery Resort and we were all very pleased with the staff, facilities, location,etc. We were close to town. The condos were clean, well furnished and very comfortable. It was also very affordable. Would highly recommend. Colleen is wonderful to work with for your vacation. What turned into a few days for a few of us turned into a family reunion and luckily there was another unit available. The rooms were comfortable and very clean. More amenities in the kitchen that you would find in ordinary timeshare properties (I know as I have stayed in several and actually own property) What attracts me to this location is the location to Branson, you are right on the lake and the water is literally in your back yard. If I did not own timeshare- I would consider owning a unit at this location! Love it! I know your family will love this place as well. We are already planning on a return trip for next year! May need more than 2 units though! Enjoyed the lake and the rental of the pontoon boat by Vickery Resorts, being on the lake tubing with the kids, nieces and nephews making great memories! We did not allow any gaming toys but instead encouraged the outdoors, fishing, swimming and they even added horse shoe pit. Grilling on your patio and enjoying each other was long overdue for our family. Highly recommend this resort to anyone. We had a vacation with extended family and everyone had a great time.